We love a challenge at Mary Hare! This year all of Year 7 have been taking part in the Race for the Line competition, a STEM event which links to the Bloodhound world land speed record project. 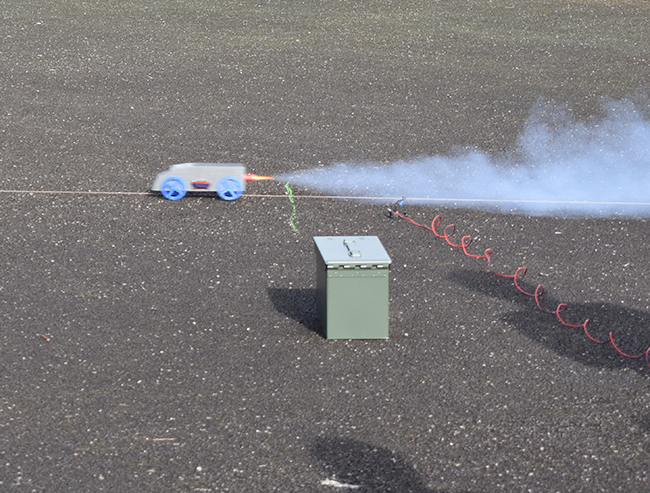 The competition involves pupils working in teams to design and construct a rocket car. The first round involved pupils building the cars in Design and Technology lessons. Once built, a race day was held on the 18th March. This day was very successful despite a few technical hitches. The fastest time recorded for the 25m run was 1.59 seconds a speed of 55 mph! We are currently waiting to hear if our time qualifies us for the regional final at RAF Benson. This is the 2nd year of the competition and we reached the regional final last year at RAF Odiham and would like to go again or even reach the national final. We will be signing up to take part in the competition for next year and hopefully rolling out some new competitions for Years 8 and 9.